Digital Storm launches its new Aventum range of gaming systems featuring the Cryo-TEC cooling system and custom designed chassis. 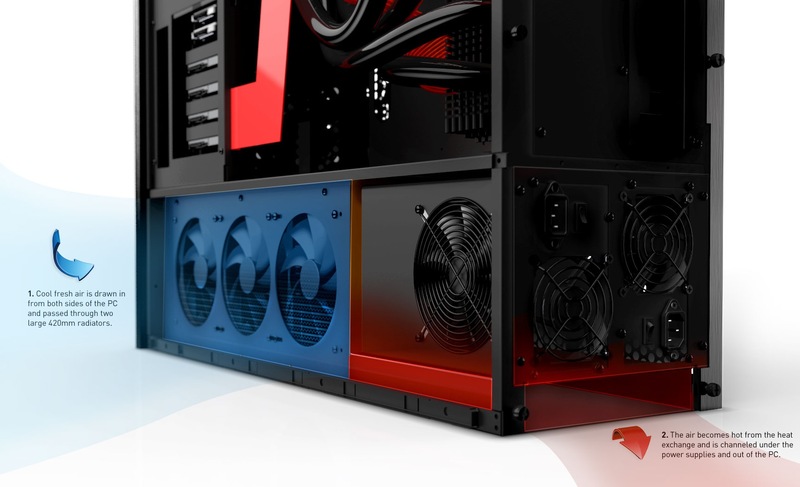 Claimed to be the industry’s first truly custom high-performance PC, the Aventum features a custom chassis that a proprietary thermal exhaust chamber, intelligent 5 thermal zone regulation and 13 customizable fans that can be controlled with Aventum software; and the Cryo-TEC liquid cooling system that utilizes direct contact heat dissipation to remove heat from the CPU and then processes that liquid through 3 massive 420mm heat exchange radiators. Digital Storm’s Aventum is available in four base configurations – Good, Better, Best and Ultimate and of course, you can customize your own system. The Aventum can be equipped with up to dual Intel Xeon E5-2630 Six-Core procesors, up to 32GB of RAM, three EVGA GeForce GTX 680 2GB with Triple SLI. As for storage, all models comes standard with 1TB hard drive and slot-loading DVD burner, and sport up to 180GB SSD. The price starts at $3859.